Read 3 times. Last read January 29, 2019 to January 31, 2019. This is one of the nicest books I've read in a long while. It's very quotidian; it essentially explores the first year of a marriage of convenience. But in watching the small details of the lives of a dozen people there are a lot of human truths revealed. This is one I will joyfully read again and again. Sign into Goodreads to see if any of your friends have read A Civil Contract. 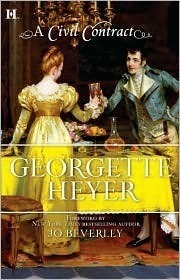 I haven't really read anything from Georgette Heyer other than the Grande Sophie. So you telling me that this is a great read, really excites me. I haven't read a Regency romance novel in a very long time.